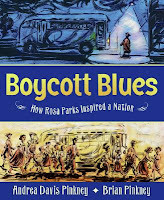 Boycott Blues: How Rosa Parks Inspired a Nation by Andrea Davis Pinkney, illustrated by Brian Pinkney. "We said if you don't, we won't. If you don't let us ride in any seat we wish, we won't ride at all. If you don't treat us fairly, we won't pay the fare. If we don't pay the fare, you won't have a bus business. And we won't let Jim Crow smack us back with his bony wings. Or slow us up with his peck, peck, peck. And we stood by our word. Yes we did. 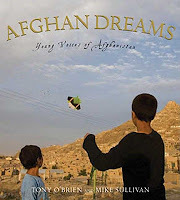 Afghan Dreams: Young Voices of Afghanistan by Tony O'Brien. This book is a collection of photographs of and interviews with children and teens in Afghanistan. Their country has been war-torn for centuries and many children go without the basic necessities. They dream of having enough food to eat, of safety for themselves and their families, of getting the education they crave, of peace. The photographs are beautiful - some joyful and some haunting. I think this is a book that could truly inspire kids to learn more about Afghanistan and to do what they can to help. It would have been useful to have included some resources for those wishing to learn more or to help in some way. I'd pair this one with other books about children across the world (maybe A Life Like Mine by DK Publishing) for a multicultural unit or display. Duel! 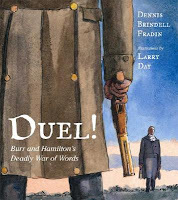 : Burr and Hamilton's Deadly War of Words by Dennis Brindell Fradin, illustrated by Larry Day. This one is a Cybils finalist in the Non-Fiction Picture Book category. The book describes the fateful duel that resulted in Alexander Hamilton's death. The feud between them ran long and the book does a great job of explaining things clearly. Plus, the art is just great. This week's Nonfiction Monday roundup is at Charlotte's Library, so head on over there to see what nonfiction the Kidlitosphere is reading this week! We just finished sharing Boycott Blues. I had the same reaction you did: it just begs to be read aloud. The only reason I know who shot Alexander Hamilton is because of that commercial (and I'm a history major). I knew Baron Burr shot Hamilton. One of my favorite coomercials! I'd never seen that commercial. It's hilarious!